By now, most know the considerable challenge of listening to instrumental music at First Church in Cambridge. In a program of Schubert, Fauré, and Beethoven, Ellipsis fell prey early on to the notorious echoing there, yet wound up pulling off the “Archduke” in miraculous fashion. Spotting a wandering member of Ellipsis before the Thursday evening program, I asked where the best place would be to listen, and the answer was “right where the trio performs.” As did most of the sparse but knowing turnout, I found a pew close up. Balance in the opener, Franz Schubert’s Notturno in E-flat Major, D. 897, was questionable, the strings often dominating. Having to adapt to the harshness of the piano in the louder B sections of the rondo was no surprise. Piano notes pinged and chimed when not blurring together. All in all it was frustrating, to say the least, trying to enter into this Schubert sphere that is too infrequently called on. As disparaging as this was, there clearly was promise that Ellipsis could engender an iteration of that piece with grace and power. In recent years, Gabriel Fauré’s Piano Trio in D Minor, Op. 120 has become ever increasingly visible on the Boston scene. Violinist Amanda Wang took a few minutes to relate her encounter in Paris as she sought advice on performing French music. She said when she executed the dynamic marking, piano, the maestro told her it was too soft and with a forte, too loud. Wang deduced from this how exacting the French really are. I might have surmised something else. Surprisingly, her sense of Fauré was less French than expected, or should have been. On another page, cellist Patrick Owen caressed and found tendresse creating those waves and surges of French affect that awaken our breathing as when spring’s fragrances flourish. Pianist Konstantinos Papadakis unfortunately ran into too much of that First Church blurring and pinging. The percussiveness of the church’s instrument was little suitable for Fauré’s modishness. Thankfully, it was an altogether different matter after intermission. From the royal implications of the very first theme on through to the finale’s last and most boisterous outburst, Ellipsis turned the tables on First Church. The decision to perform Piano Trio in B-flat Major, Op. 97 “Archduke” redounded in no small way to the Ellipsis trio’s credit. In fact, the trio’s feat was illuminating in unforeseen ways. Ludwig van being truly a master was furthered still, and, I would hasten to add, such ear-opening experiences are not a daily occurrence. Perhaps ears were primed earlier on, accustoming themselves to the challenging acoustics of this venue, but I think not. 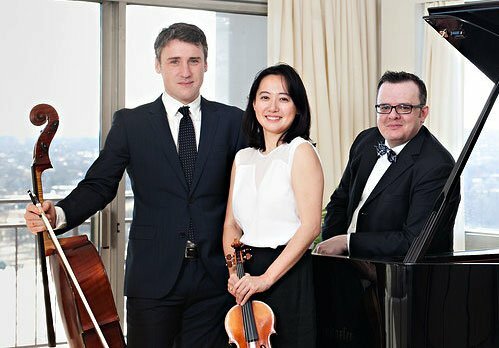 Beethoven’s middle period trio is expansive, its length 40 minutes plus. Within the four-movement work, constant dynamic contrasts, quicksilver shifts in texture, and accents thought of as variant punctuation, all found heightened expression. Beethoven came brilliant-cut crystal. Ellipsis and the “Archduke” actually appeared as though they were suited for this space. Ellipsis’s ducal mien transformed First Church. And cheers for Papadakis, who once again finds himself at an instrument without full-sized refinement and reach, but fitting that piano hand in glove for its mission. There was still more to Ellipsis’ discovering translucent expression. Breaking with current trend, the trio did not go for in-the-moment thrills or grandiloquence, but rather took to plain old storytelling, brilliantly illuminating the master’s dramatic schemes, mischievous routes, the ebb and the flow, and the climactic.